After the fun of making the easiest (yet ever so tasty) Gluten & Dairy Free Pizza Twists thanks to Pillsbury’s Gluten Free Thin Crust Pizza Dough and sweet little Gluten & Dairy Free Apple Hand Pies from Pilsbury’s Gluten Free Pie and Pastry Dough, I wanted to try something else fun and kid friendly that could go in the lunch box or be had as a snack. 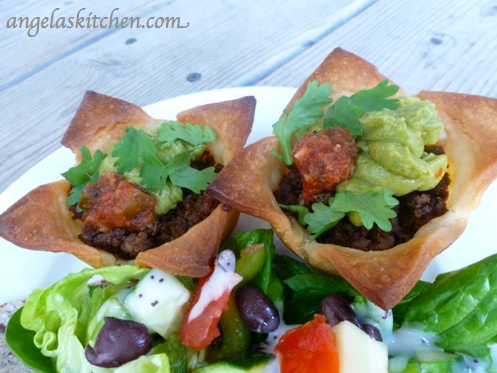 My kids were in the mood for tacos, so Gluten Free Dairy Free Taco Cups are what we came up with. These tasty bites were so fun to make! I used my regular taco meat seasoning, but use what your family likes. We tried two different styles for the cups. After kneading Gluten Free Pie and Pastry Dough, we rolled out half of the dough and cut it into 6 squares about 4 1/2 inches. 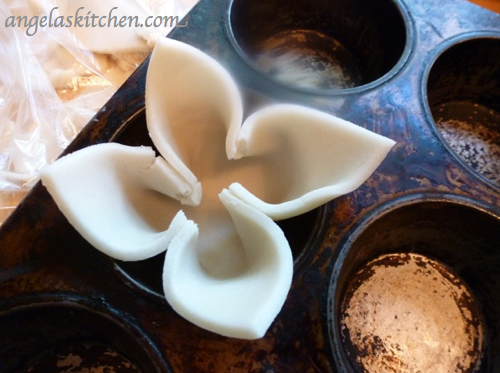 I tucked the dough into a muffin cups leaving the tips of the squares out to make a petal-style or star-style cup. The other half of the dough I rolled into a rope and cut into 8 sections. After putting the one of the sections into each muffin tin, I pressed the dough evenly around the muffin tin. Either way you make them, they turn out delicious! 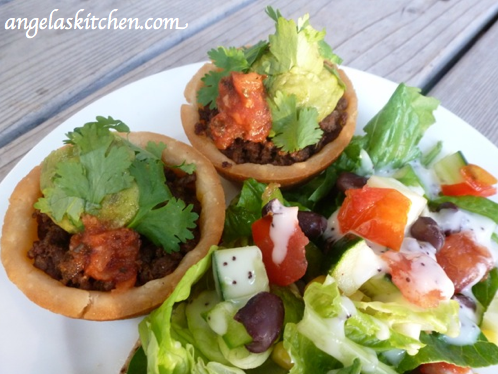 We served the taco cups for lunch with Tex-Mex Salad. I am making some for the school lunch boxes and think these would be a great game day snack. What would you serve taco cups for? What do you think of Pillsbury’s new gluten free products.? Have you tried the Chocolate Chip Cookie (however, this contains milk for those cow milk allergic, like myself), Thin Crust Pizza Dough or the Pie and Pastry Dough? Thank you so much for the three gluten free products, Pillsbury! They are so fun to use! Taco toppings of choice. We used guacamole, salsa and fresh cilantro. Cook ground beef, breaking it apart while cooking. Drain grease from meat when beef is browned. Add onion, salt, chili powder, cumin, garlic, red pepper, and oregano and stir well. Remove from heat. For flower/star cups: Knead pie dough until no longer crumbly. Roll out on plastic wrap and cut into 12 squares approximately 4 1/2 inches. 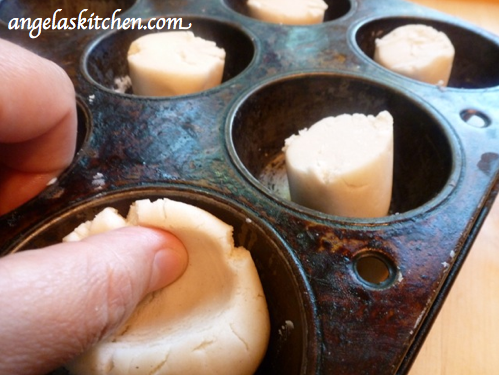 Tuck squares into every other muffin tin allowing points to stick out on tin. 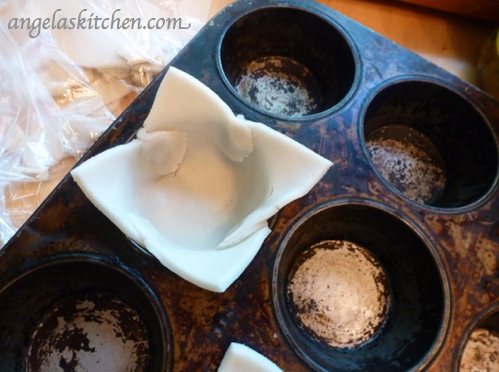 Press any dough flaps in muffin tin to create more room for filling and to make a neater appearance (see photo). For plain taco cups: Knead pie dough until no longer crumbly. Roll dough into a snake or rope. Cut into 16 equal pieces. 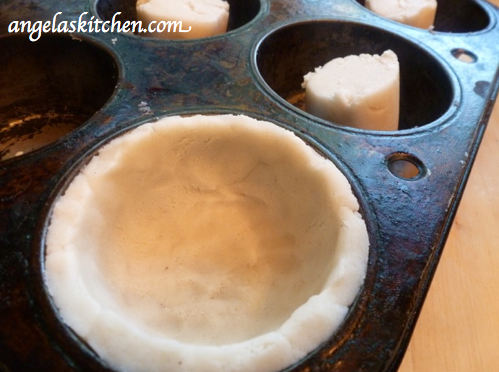 Place a piece of dough into a muffin tin, pressing into an even layer on bottom and sides of muffin tin. Divide meat between pastry cups. Bake in preheated 425 degree F oven 15 to 18 minutes or until pie crust is golden brown and cooked through. Remove taco cups from pie tin and top with your favorite taco fixings, like guacamole, salsa, olives or fresh cilantro. This article is sponsored by Pillsbury®. All opinions are my own. Thank you, Pillsbury®, for sponsoring today’s discussion! Love this idea, too. Fabulous!